You can completely hide a user interface element from the mouse by setting its IsHitTestVisible property to false. When this property is false, no mouse related events will be fired for that control. In the example below, one Label has its IsHitTestVisible property set to false. 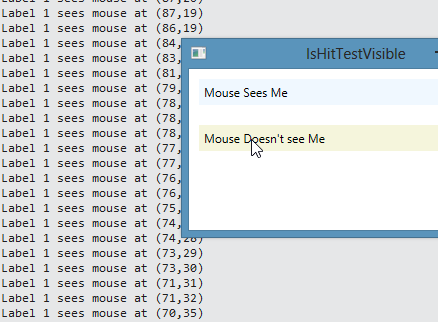 <Label Content="Mouse Sees Me" Background="AliceBlue" Margin="10"
<Label Content="Mouse Doesn't see Me" Background="Beige" Margin="10"
When we move the mouse over both labels at runtime, we only see output when it moves over label #1, which does not set IsHitTestVisible to false.